This post is sponsored by St Pierre Bakery. All opinions are my own. 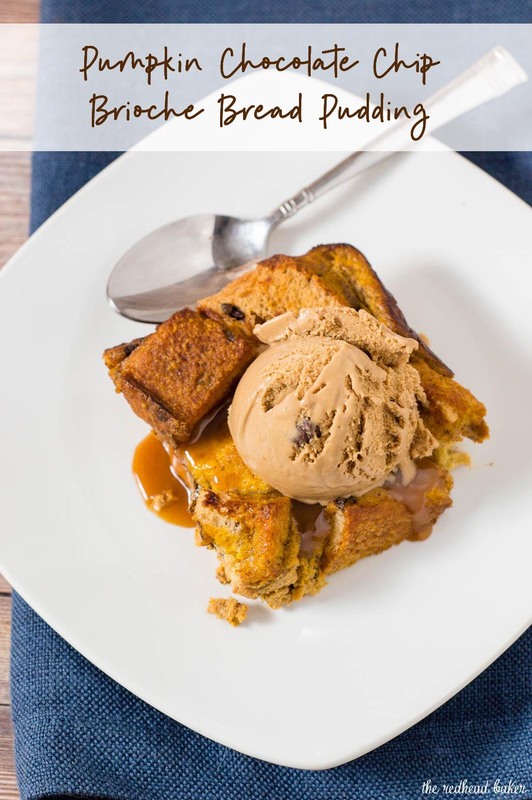 Pumpkin chocolate chip brioche bread pudding is a warm, comforting fall dessert, perfect for the holidays or any chilly night. Top with vanilla ice cream or caramel sauce. I love brioche. 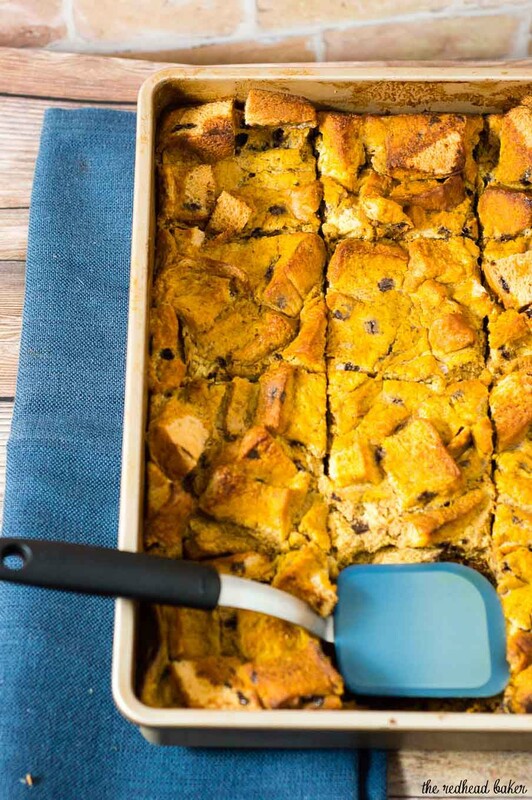 It’s so rich and delicious, whether eaten by itself, used in savory dishes like stuffing, or sweet ones like French toast or this pumpkin chocolate chip brioche bread pudding. Bread pudding originated as a way to use up stale bread. There are variations in cuisines from all over the world. The bread is cut or torn into cubes, then soaked in custard, sometimes dried fruit or other flavorings are mixed in, and finally baked. It’s often served with a sauce poured over top. 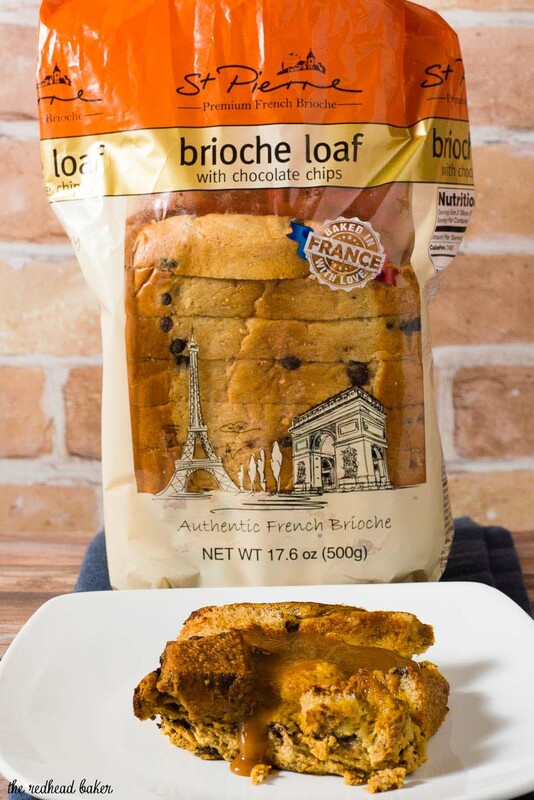 This chocolate chip brioche loaf from St. Pierre Bakery is loaded with little chocolate chips, which add to the flavor of the bread pudding. St. Pierre Bakery are baked in France, using authentic French recipes, to give you a taste of the continent right in your own home. Their bread never contains GMOs, hydrogenated oils or high fructose corn syrup. It’s almost a shame to let the delicious slices sit out to intentionally get stale, but the final dessert is really worth it. The custard is a blend of eggs, milk, cream, pumpkin, vanilla and spices. It’s a really simple dessert to make! It can be made up to a day ahead of time, then reheated in the oven to be served warm, which is a real bonus on holidays like Thanksgiving, where oven real estate is at a premium. 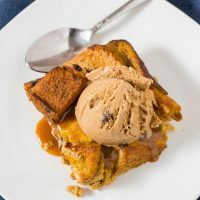 There are many sauces that would complement this bread pudding: caramel sauce, creme anglaise (traditional or flavored with hazelnut liqueur), but I think my favorite topping is caramel gelato. 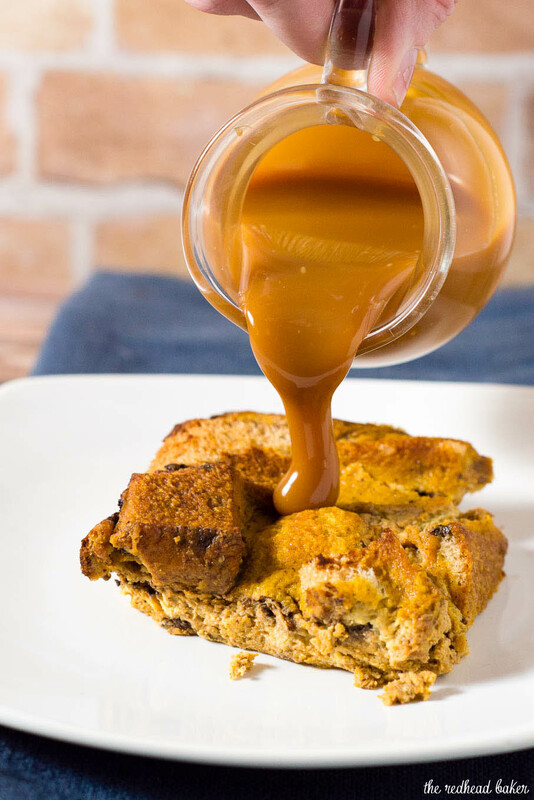 When served on top of warm bread pudding, it quickly melts into a delicious sauce that moistens the crispy edges of the bread pudding. 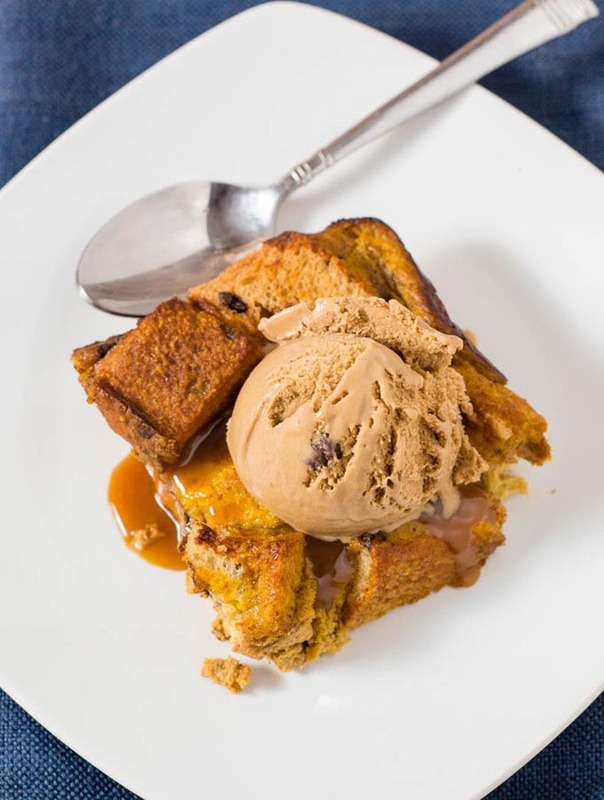 Want to make this delicious brioche bread pudding for yourself? Look up where to buy St. Pierre Bakery bakery products near you! In addition to this tender, buttery brioche, they also make chocolate-and-hazelnut-filled crepes, croissants (both plain and chocolate-filled) and waffles. Suggested toppings: vanilla ice cream, caramel sauce, or a simple icing of confectioners sugar and milk. In a large bowl, whisk the eggs, milk, cream, vanilla extract, spices and pumpkin purée. Set aside. Cut the stale bread into cubes, and spread in a layer in a greased 9x13 baking dish. Bake uncovered for 45 to 60 minutes. The bread pudding will puff up and should spring back when lightly pushed. I’ve been totally drooling over this. I just shared it on Twitter. I can’t stop going for another look. I really must make this. The flavours are just perfect! This is ridiculously tempting. I have such a weak spot for brioche and to see it turned into a pudding with the pumpkin and chocolate is total decadence. Pinned! 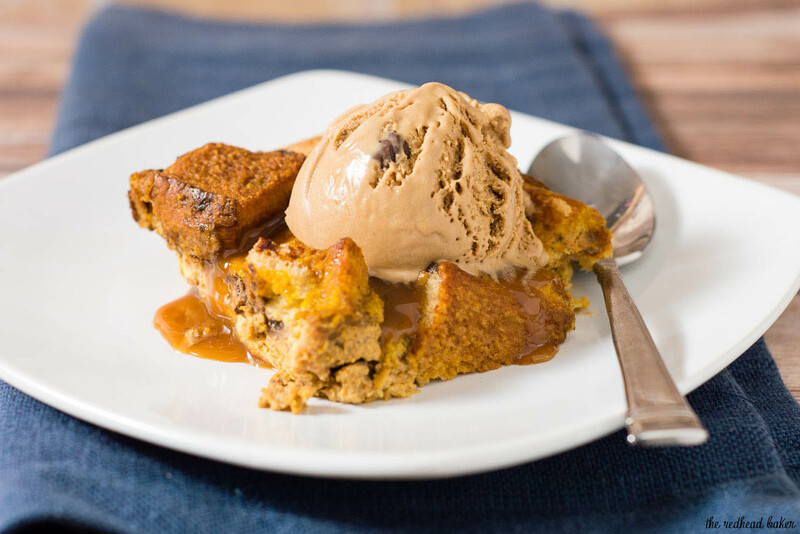 Swooning over this bread pudding! This needs to happen asap!